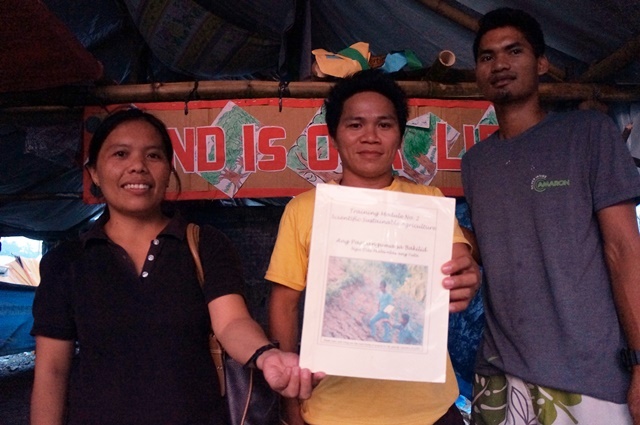 TANDAG CITY, Surigao del Sur – Teachers and community members who have graduated from the Alternative Learning Center for Agricultural and Livelihood Development (Alcadev) hold a textbook in their makeshift classroom in the evacuation site at Tandag City, Surigao del Sur. The textbook may seem ordinary at first glance. But it is not. The contents of their workbook were based on studies on sustainable and organic agriculture. But every year since Alcadev began in 2004, both teachers and students evaluate and revise their textbook accordingly, to incorporate what they had learned as they applied it in their respective farms. “The efforts of the school to help us improve our lives have long been vilified. The government said our teachers taught us how to handle guns and rifles. 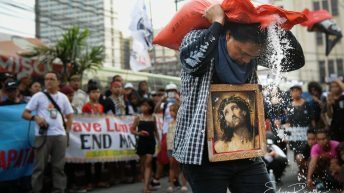 That is a lie,” Lito Sanchez, 28, one of the first graduates of Alcadev told Bulatlat.com. 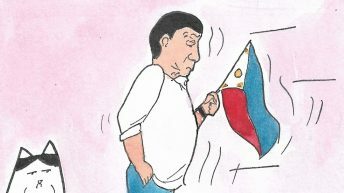 The Alcadev was formed through a joint resolution of the two tribal organizations, Kahugpungan sa mga Lumad nga Nagkahiusa sa Surigao del Sur (KALUNASS) and the Malahutayong Pagkabisog alang sa Sumusunod (Mapasu). Since its establishment, Alcadev provided both academic, vocational and technical skills to its students, who came from 32 Lumad communities all over the Caraga region. It began with only 10 students when it was founded, but the enrollees increased by 46 percent annually. Today, nearly a thousand Lumad have received education from Alcadev in its two campuses – in Han-ayan, Diatagon village in Lianga, Surigao del Sur and in Padiay village, Sibagat, Agusan del Sur, which was only established in 2013. Apart from eight regular subjects that are also being taught in government-run schools, Alcadev has another core program – the Food Security Project – which teaches sustainable and organic farming. 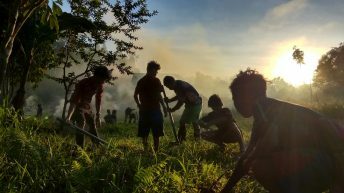 Among what Sanchez and fellow Alcadev graduate Richard Campos, 24, considered as “traditional farming” was the kaingin system or the slash and burn farming method. Both agreed that it was not sustainable and that their forest cover would have decreased tremendously by now, if not for the intervention of Alcadev, which taught them to strike a balance between nurturing the environment and sustaining their needs. Their parents used to burn down felled leaves and weeds. But through mulching, students learned not to do so and instead use it to cover the top soil. Sanchez said this was meant to keep the soil moist and conducive for plants. He added that this way, they need not water the crops often. They were also taught how to turn animal wastes into compost fertilizer, which would otherwise be treated as waste by their parents. On their third year, Alcadev students learn how to concoct natural pesticide instead of using chemical pesticide. The ingredients of a natural insect attractant could be found among their kitchen supples – vinegar, sugar and water. They place the solution near the crops so that pests would be attracted to it, and trapped. They also planted onions and lemongrass near their crops as these are also natural insect repellants. “It was very different from what we knew before and it was hard to implement. Both Trifpss and Alcadev brought big changes to our community. The sustainable farming helped us realize that we can improve our lives without damaging the environment, and by caring for animals,” Campos said. Students also develop a whole-year planting plan, which includes intercropping. In the past, they only harvested upland rice once a year. But through intercropping, they not only have upland rice but corn and sweet potatoes as well. To address the gap between parents and students, Joey Dorilag, an Alcadev teacher and head of the Food and Security Project of the school, told Bulatlat they held a series of trainings designed for parents so that their knowledge on the new technology and farming means would meet halfway. The trainings worked and the new technology and farming were eventually adapted by the parents. 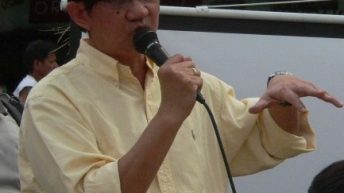 In a primer furnished to Bulatlat.com, food crop production has increased from 38 percent to 2007 to 88 percent in 2013. The increase has allowed families to send their children to college and sustain their needs. “Before, our produce was only meant for our consumption. Today, we can sell some of our produce so we can buy salt, sugar and other needs,” Campos said. Dorilag said they also introduced cash crops, such as abaca so Lumad families could earn more. Such improvement in their livelihoods is a big leap as the Caraga region is among the poorest in the country according to government data. 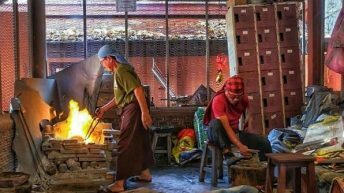 The Department of Social Welfare and Development said in a study in 2013 that half of the region’s 2.4 million population are living under the poverty threshold, despite the increase in the region’s gross domestic product from 7.4 percent in 2010 to 9.6 percent. Alcadev graduate and now a parateacher for Trifpss Glorivic Belandres said the two Lumad schools were longed for by their tribe as most of their elders were not able to go to school. The government-run school is about 16 kilometers away from their community. She said that apart from what they learned from school – both in academics and in sustainable farming – the Lumad people were able to overcome their “shyness,” which she said could be “cultural” as they have long been discriminated. “Most importantly, we learned to fight for our rights if others attempt to trample on it. This has become a threat to the military. As soon as we were educated, they found it difficult to deceive us,” she said. Since its founding, the school has nearly a hundred percent passing rate in the government’s equivalency examinations that would allow their students to attend college. But Campos said most students prefer to return to their communities and apply what they learned to the land they till. Still, others who proceeded to go to college eventually return to their community – at times to do developmental work for their community through various non-government organizations, or teach in their tribal schools. 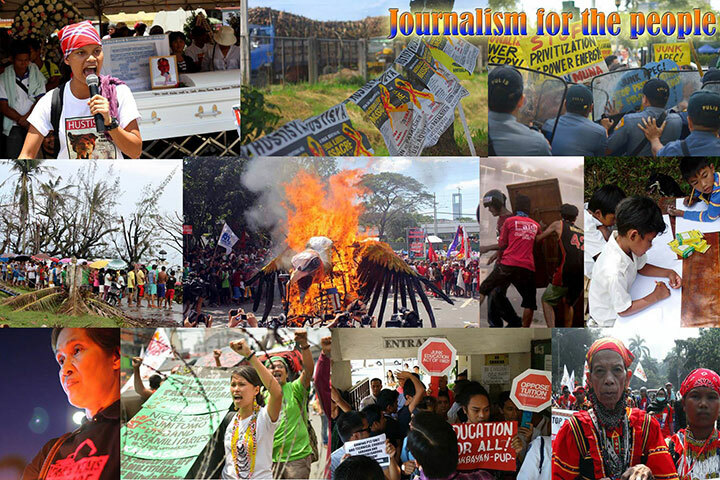 For all that Alcadev has contributed to their community, the school is still being targeted and vilified by the Philippine military as a training camp of the New People’s Army. Alcadev teacher Lorena Dorilag attributed the attacks against them to the “liberating education” they provide, as they cannot confine their students within the four walls of their classrooms, when they need to face harsh realities outside. “They need to know their rights and the role they play for our country,” she said. Campos said it is “natural” for a Lumad to be against mining because it would destroy not only their land and livelihood but also their lives, identity and culture. But the height of these attacks came last Sept. 1 with the killing of their two tribal leaders Dionel Campos and chieftain Juvello Sinzo and no less than the executive director of Alcadev, Emerito Samarca. This has led the Lumad to forcibly evacuate to Tandag City. 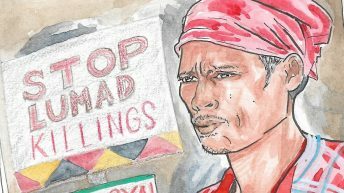 Campos, who is the nephew of the slain tribal leader, said the Lumad will accept nothing less from the government but to disband the paramilitary group it formed and armed to harass, threaten and even kill those who are struggling to protect their ancestral domains. Despite the dire conditions at the evacuation site, they have also turned down the national government’s offer for a relocation site. Why would they accept such offer when they have thousands of hectares waiting for them in their community?